Lineage. Constituted 15 Communications Squadron, Command on 24 Apr 1946. Activated on 14 May 1946. Inactivated on 23 Jan 1947. Redesignated 15 Communications Squadron, Operations on 27 Aug 1952. Activated on 20 Oct 1952. Redesignated 15 Communications Squadron, Air Force on 15 Nov 1954. Inactivated on 18 Jun 1955. Activated on 15 Jul 1958. Discontinued, and inactivated, on 1 Jan 1963. Redesignated 15 Operations Squadron on 20 Oct 1971. Activated on 1 Nov 1971. Inactivated on 30 Jun 1975. Redesignated 15 Operations Support Squadron on 1 Apr 1992. Activated on 13 Apr 1992. Assignments. Third Air Force, 14 May 1946; Ninth Air Force, 1 Nov 1946-23 Jan 1947. Ninth Air Force, 20 Oct 1952; Twelfth Air Force, 23 Apr 1953-18 Jun 1955. Ninth Air Force, 15 Jul 1958-1 Jan 1963. 15 Air Base Wing, 1 Nov 1971-30 Jun 1975. 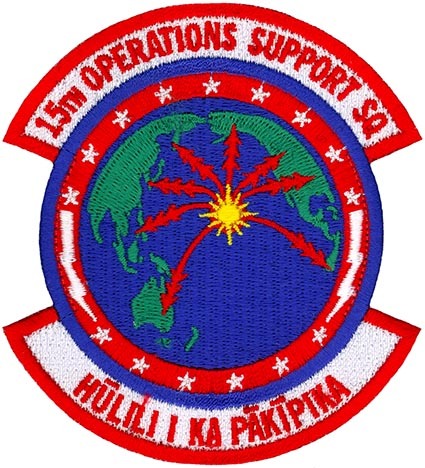 15 Operations Group, 13 Apr 1992-. Stations. Greenville Army Air Base, SC, 14 May 1946-23 Jan 1947. Sewart AFB, TN, 20 Oct 1952-28 Mar 1953; Furstenfeldbruck AB, Germany 20 Apr 1953; Ramstein AB, Germany, 16 Jul 1953; Evreaux AB, France, 11 Oct 1954-18 Jun 1955. Shaw AFB, SC, 15 Jul 1958-1 Jan 1963. Hickam AFB, HI, 1 Nov 1971-30 Jun 1975. Hickam AFB, HI, 13 Apr 1992-. Operations. Provide airdrop support and scheduling, survival, evasion resistance, and escape training, intelligence updates, weather forecasting, and airfield support. Decorations. Air Force Outstanding Unit Awards: 13 Apr 1992-30 Jun 1993; 1 Oct 1993-30 Sep 1995; 1 Oct 1995-1 Aug 1997; 2 Aug 1997-1 Aug 1999. Emblem. Approved on 31 Dec 1959; modified on 29 Jul 1999.